I feel very glad to post my new experiment with paper plate using paper mache technique. Make 4-5 thin rolls of news paper and stick them to make design you want onto back side of paper plate. Stick thick paper rolls on edges of plates. Once you complete with design and edges. Add white school glue in water and mix well. Make small pieces of tissue paper. Dip painting brush into diluted glue and stick small tissue paper pieces onto plate. Keep repeating the same process till all paper rolls get covered with tissue paper. Use some dark colored gift wrapper paper to give bright edges to plate. Let it dry overnight. White glue becomes transparent after drying. On second day, Paint plates with acrylic colors. Make a design of your choice. Apply some stones and sparkles to highlight design. Attach both the plates using knitting wool. As these paper plates are light weight, knitting wool would work. I have made 2 flowers with same technique and painted with acrylic color. 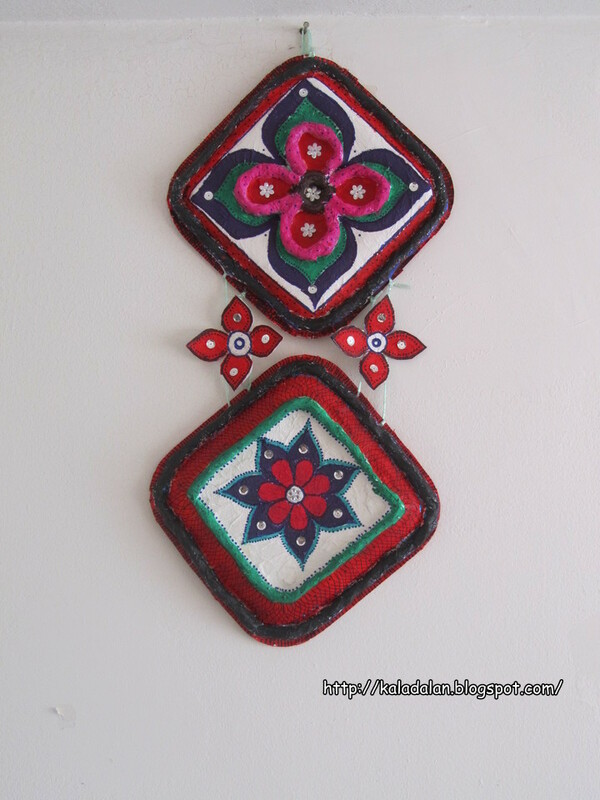 You can use anything of your choice and your home made paper plate wall hanging is ready. Sab arts ek se badhkar hai !!!! I love Craft Blogs but I am not as creative as you. Nevertheless, I really like hanging out on creative blogs like yours. Good Job. Looks very beautiful, I love your salted dough creations too, lovely! Great work! :) Just peeped into your blog.I'm Kavi's friend . very very creative....following u !! !